On 15 December 2011, Pennsylvania Governor Tom Corbett approved Senate Bill 361, thereby amending the Vital Statistics Law of 1953 and providing public access to birth and death certificates after a certain number of years. With this law, Pennsylvania births become public records after 105 years and deaths after 50 years. A few short months later, indexes to the now-public records appeared online at the Pennsylvania Department of Health‘s web site; births from 1906 and deaths from 1906-1961. The importance of these records is obvious. 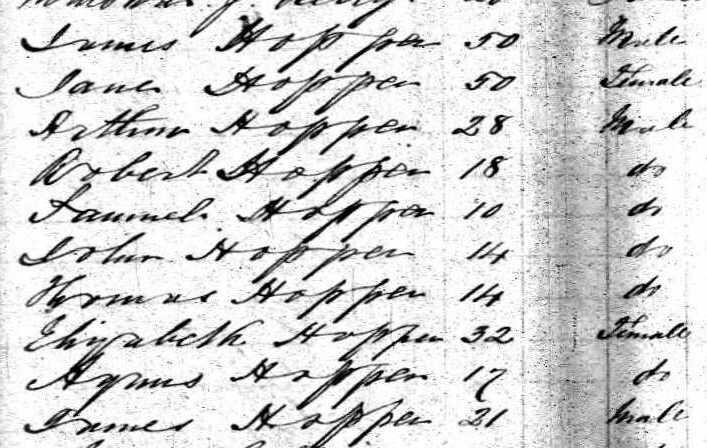 Given Pennsylvania’s geographic location, its sheer size and population, and its role in the growth and development of the national economy, these now-accessible records have transformed genealogical research in the Keystone State. So many of our ancestors, particularly those from Michigan and the Midwest states, have origins in Pennsylvania. Indeed, with my maternal line’s deep roots in the Pittsburgh area, this new law offered limitless opportunity to further my own research. Two of my enduring family history mysteries are Frank and Mary Kamp. After living in Washington County, Pennsylvania at the time of the 1920 U.S. Census with their son, two daughters, and a son-in-law, the couple seemingly vanishes. I picked up the individual trail of each of the children in the 1930 Census, but Frank and Mary continually eluded my grasp; even a research trip to western Pennsylvania failed to shed much additional light. Of note, a conversation with my great aunt revealed that she had memories of her grandparents, and suggested that Mary had passed away long before Frank did. 1927 death index entry for Mary J. Kamp, Pennsylvania Dept. of Health. If this is my Mary, it would fit the timeline as suggested by my great aunt. In addition, Allegheny County is just north of where the family was in 1920 and Mary’s daughter Julia’s in-laws lived there in the county just south of Pittsburgh for many years. 16 to 18 weeks (!) and a small $3 fee later, I received a copy of the death certificate in the mail. Eureka! 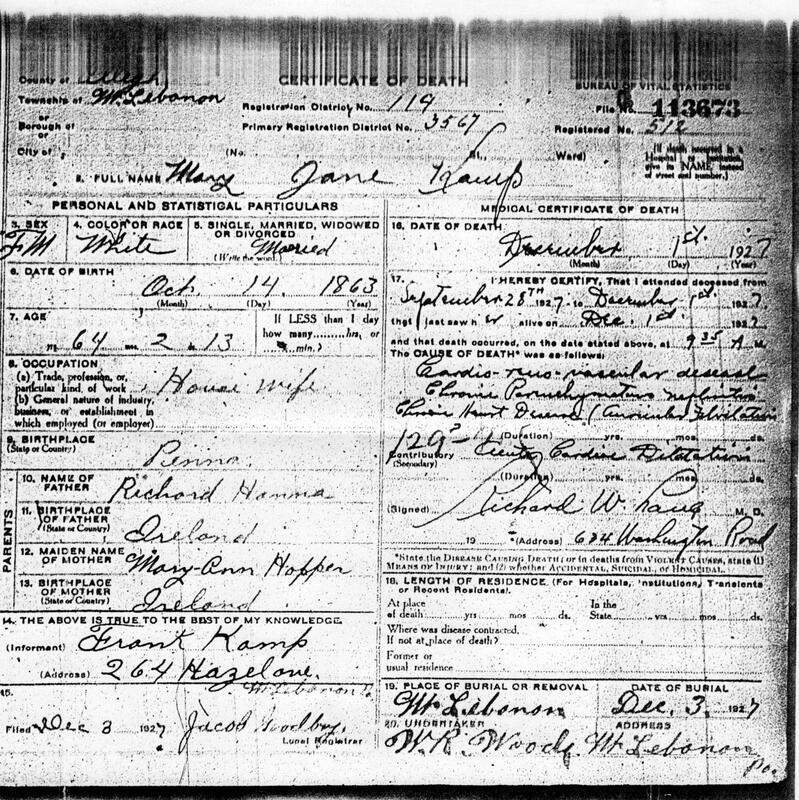 Mary Jane Kamp death certificate, Pennsylvania Dept. of Health, 1927. #113673. This death record both verifies existing data (parents’ names and birthplaces), but offers new information (exact birth date, age at death, exact death date, cemetery name, burial date, Frank’s address at the time of Mary’s death, undertaker). In a frustrating bit of irony, I was actually at Mt. Lebanon Cemetery a few years ago during my Pittsburgh research trip, yet I was focused on a different line in my research, so completely missed a chance with the Kamps. Oh, the irony! Armed with this new information gleaned from the now-accessible death certificate, I will again attack the 1930 Census in a (vain?) attempt to locate Frank. In addition, I will continue to search in later years at the Department of Health’s death indexes, perhaps before the 1940 Census. The research never ends!